You might not have heard about Unihertz Jelly Pro, which is also affectionately called the Jelly Phone. It is a really tiny smartphone and made by a Chinese company called Unihertz. Even though the phone is tiny, it is packed with powerful features. In fact, you might not believe your eyes when you see the specs sheet of the Unihertz Jelly Pro. It is an Android LTE smartphone and sports a 2.45-inch display. The longest side of the phone is just 9.2 cm. 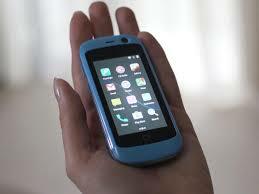 The Jelly Phone is the smallest 4G smartphone and despite being small, it works just as well as any other smartphone. If you are curious to know more about the Jelly Phone, read on! The phone has a modest hardware as it has not been designed to give a great performance. It has been made to perform simple operations and run the operating system smoothly. The Unihertz Jelly Pro is powered by the 1.1 GHz Mediatek 6735 quad-core SoC. It also has the Mali T720 GPU. The phone has 2 GB of RAM. The Pro version, which only retails in Europe, has an internal memory of 16 GB. In other markets where the phone has been released, you can also get that standard version with the 1 + 8 GB storage combination. The phone’s connectivity is also good. It has WiFi a / b / g / na dual-band, LTE, GPS and Bluetooth 4.1. The Jelly Phone does not have an FM radio. Since it is a compact phone, you cannot expect it to have all the sensors. It has the gyroscope, accelerometer, and the magnetometer, but the proximity and the brightness sensor are missing. Despite its small size, the Jelly Phone isn’t disappointing at all. It’s phone also works well and there are usually no connection problems. It is a dual-SIM smartphone and the second slot is not the same as the microSD slot. The Bluetooth and GPS also work fine. They are particularly useful if you use the phone to play games. The performance of the phone is sufficient for normal use. However, since the phone has a modest hardware it may get slower during a period of heavy use, such as when you are multitasking or playing games. The phone performs most operations without any issues or big slowdowns, which is great. If you are used to using bigger phones, it may take you a while to get used to the Jelly Phone. It is less than 5cm wide and only weighs 73 grams. The small size is the main feature of the Unihertz Jelly Pro, but there are some advantages and disadvantages of that. You can easily carry the phone anywhere but sometimes it may seem complicated to use the keyboard and some applications. 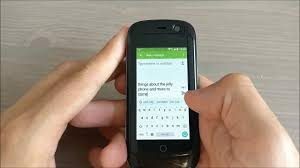 However, the keyboard problem isn’t really an issue as Android offers a lot of options to type vocally and also offers keyboards with T9 prediction. However, the tiny keys can still be tough to tap on. It can also be problematic to use an app that has a lot of elements near the interface. The phone is made of plastic. It has been assembled well and is very solid. The back cover can be removed to replace the battery and insert the MicroSD or two nanoSIM. It is also very convenient to remove the SIM or them battery without needing to use a pin. It compliments the main characteristic of the Jelly Phone: its portability. The front part of the phone has three soft-touch keys, They are all backlit. There is also a circular home button. The RGB LED backlighting of the home button changes color and serves as the notification and status LEDs. The phone has a 2.45-inch LCD display with a resolution of 243 x 320 pixels. Even though it is by no means a large display, its readability is great even outdoors. The only issue is the limited viewing angles. However, if you consider the dimensions, you can’t really hold it up against the quality of the panel. The mono speaker is rather poor and disappointing. However, the audio jack comes in handy for listening to audio or making or receiving calls. The Jelly Phone has two cameras. There is an 8MP camera on the back and a 2MP camera on the front. With those sensors, you cant really expect to take high-quality pictures or selfies but is still good enough to make memories. Even though the Jelly Phone didn’t receive a lot of good reviews initially, recent updates seem to have fixed the situation. Even though camera images aren’t of high quality, they aren’t bad at all. In fact, if you pay attention while clicking pictures, you might even get a good shot. 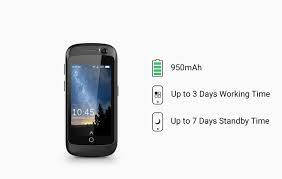 The Unihertz Jelly Pro has a 950 mAH battery and the phone lasts a day on it. The phone also has some energy saving options. The Jelly Phone is also used as an extra phone by some people so you can take it with you while going on trips and adventures along with your primary phone. While on standby, the Jelly Phone consumes almost no power. So, again, you can take it with you on adventures as an extra phone and not worry about the battery discharging. You can use it when your primary phone runs out of battery. The phone runs Android 7.0 Nougat. It is slightly revised and very simple and it is comparable to Android Stock. Even though the phone does not have a lot of exclusive features, Unihertz must be lauded for offering a simple and clean user interface. There are also some energy saving options such as “Dura Speed” which lets you hibernate unused apps when the phone is on standby. This minimizes battery drainage. There is also an option to delete the memory footprint of all applications when they are no longer used. Their access to data networks can also be prohibited. This allows you to increase the autonomy of the phone. The Jelly Phone also receives frequent updates, which is great. This is indicative of the company’s commitment to the phone and shows that the company is always engaged in development. We are sure that the Unihertz Jelly Pro or the Jelly Phone must have piqued your curiosity. Currently, it is the smallest 4G Android smartphone in the whole world. Although some obvious compromises will have to be made, the Jelly Phone is still a very useful product. For instance, you can carry it around anywhere easily. A dedicated sports app also allows the phone to double up as a smartwatch. 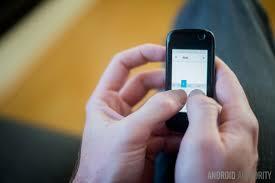 The phone can also perform most tasks with ease. For instance, you can use WhatsApp on it, you can use it to reply to emails, or you can use it to share content on social media. In short, it is a complete smartphone. Even though it may not be feasible as a primary phone, it can be ideal in many situations. The phone costs around 100 euros and can be bought from Amazon. The phone has a great battery life and its quality-price ratio is also good. Would you consider buying the Jelly Phone? Share your thoughts with us in the comments below! Previous articleOnePlus 6 Review: Great On All Counts!